Gary Hirshberg, CE-Yo of Stonyfield Farms is a self-described “passionate capitalist” who has created millions of dollars of capital for investors and measures progress in numbers and assets. Like Hirshberg, I believe that business is the most powerful force today to bring about social change. 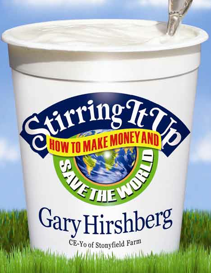 After listening to a podcasted conversation between Hirshberg and Clif Bar founders Gary Erickson and Kit Crawford*, I bought his book Stirring it up: How to Make Money and Save the World and annotated the heck out of it. While it is worth reading in its entirety, I wanted to share the most persuasive points I took away. Stonyfield pays some of its organic suppliers up to twice the market rate for conventionally grown materials. They scarcely advertise and use their packaging(yogurt lids) to promote other organizations. They push for more government regulation and oversight in the organic and consumer food industries. They report on how much pollution and waste the company generates, even when these numbers rise. Running a business that is more than profit-focused works out financially in the long-term, if not in the short-term as well. Stonyfield was obliged to cover $4 million in unexpected supply costs due to a shortage of organic milk. To balance the expense, marketing was cut. Notwithstanding, customer loyalty and product preference pushed sales up by 25%. “Serving humanity pays.” A company that meets its customers’ best instincts while making high-quality products has a competitive edge. Satisfy your customers’ product needs and their emotional needs. Today this overwhelmingly means consumers want to feel morally good about what they purchase. A strong mission statement gets you through the blizzard. If your mission is clear and inspiring and you use it as the cornerstone of your business–your unique raison d’Ãªtre–you won’t have trouble convincing customers of the superiority of your product or service. You make money by enforcing precise standards, putting your heart and soul into producing the best product and, above all else, holding fiercely to your mission. Bizarre antics earn you free media coverage (Stonyfield set up a fiberglass Jersey milk cow that pooped out manure-like potting soil at a Chicago park). A guerilla marketing campaign can get you what you need for 1 percent of the price of a traditional advertising blitz. Brands flourish when they acquire personalities that attract people. Lack of traditional advertising (for Stonyfield, a consequence of a pint-sized marketing budget) can work in your favor by making customers feel they are part of a select group. Less waste saves you money twice. You pay less to get it and less to have it taken away. Interface saved $336 in just over a decade from reducing product waste. They continue to define waste as any cost that does not provide value. *Hat tip to Lee Fox (@KooDooZ) for pointing me to the Stonyfield/Clif Bar conversation. Carolyn, terrific. I found it easily accessible and full of great examples and heretical ideas. I have on my list “Let My People Go Surfing” by Patagonia founder Yvon Chouinard and “Raising the Bar” by Clif Bar founder Gary Erickson.